« Lin Yilin belongs to the Big Elephant Tail Working Group that emerged from Guangzhou in the early 1990s. The members of the now defunct group, Chen Shao Xiong, Liang Juhui, Lin Yilin, and Xu Tan, presented regular performances and site-specific installations to intervene directly with the rapid social and political transformation of the city of Guangzhou. Being one of the first cities in which the new economic experiment of China took place, the rate of urban development in the early 90s was almost unprecedented. Keenly aware of the limited time frame of the economic open door policy, the order of the day was to accumulate as much wealth in the shortest time possible. Rem Koolhaas, in a seminal study of the urban development of the Pearl River District, labels Guangzhou a “City of Exacerbated Difference.” The conventional idea of a region as a harmonious entity breaks down the moment we try to arrive at a systematic understanding of what is going on in the PRD. Koolhaas claims that it is precisely the irreconcilable differences of these cities located in the PRD that substantiate their respective identities. The mission of each city is to strive to become as different as possible from its competitors, to make Hong Kong different from Guangzhou in every possible way. The moment when one city becomes like the others is when the city begins to lose its vitality. During this time, popular cultures and media from nearby Hong Kong and icons and merchandise from the “West” were dutifully consumed with little resistance. The direction of culture was adrift in a socialist turned ultra-capitalist society. The lack of official venues for hosting exhibitions or cultural events in the early 1990s meant the working group had to take their actions to the street. The Big Elephant Tail Working Group was crucial in preserving the integrity of critical art practice at such a unique historical juncture. They questioned the common ambition to develop the city at the expense of ignoring all social and moral values. Keenly aware of the ineffectiveness of the avant-garde movement in early 1980s China in refuting official ideology, the group’s mission was less to initiate social changes than to question the relevance of contemporary art in everyday life. 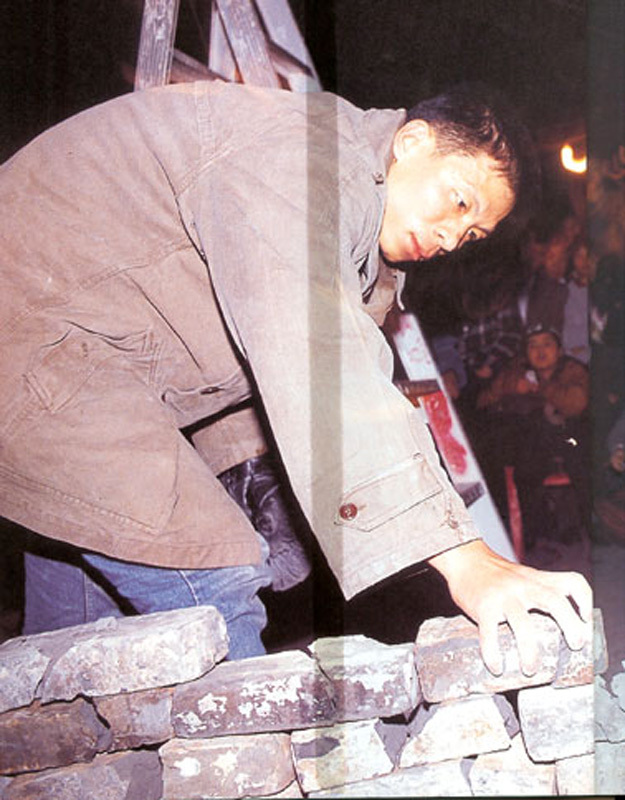 Lin often uses abandoned building materials for his performances that carry a heavy political tone. Bricks are essentially lifeless and cheap materials necessary for the construction of a new city. The dream of western style living meant buildings are often dismantled after a short period, in order for new re-development to take place. The population is always on the move in search of a better living situation and to elevate itself to higher social stratum. 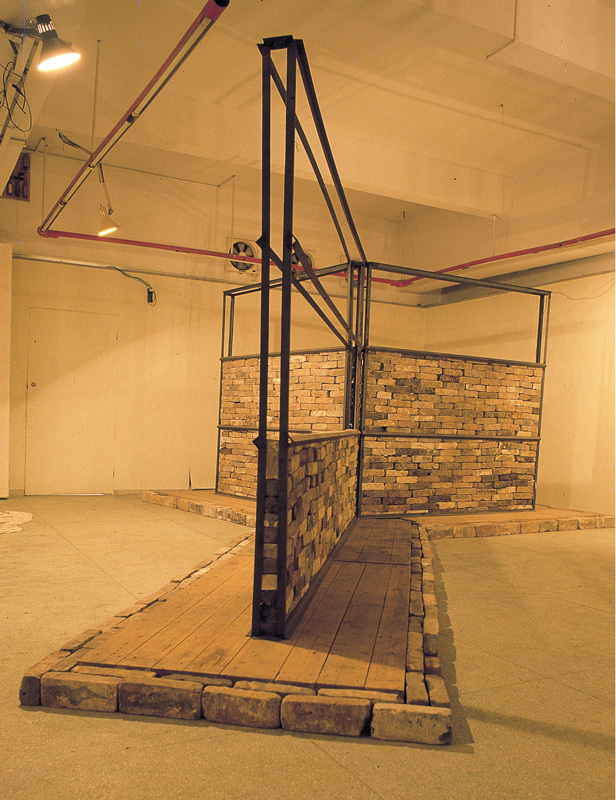 As early as 1993, Lin used bricks to construct a standard residence in order to investigate the idea of modular living. For Safely Maneuvered Through Lin He Street, Lin installed a brick wall of approximately ten feet by five feet on one side of the street. Lin He Street is one of the busiest streets in the new part of Guangzhou with multiple high-rises under construction. Moving brick by brick from top to bottom and column-by-column, Lin gradually set the whole wall in motion with little interference from the on-going traffic. The whole performance took roughly 30 minutes to complete. Only when we mobilize such basic materials in the domain of urban development do we procure an economic profit. Once the object ceases to move, it becomes merely dysfunctional material. Lin’s performance itself is dysfunctional and questions time and human labor as forms of commodities. Lin’s unproductive labor is itself a discursive statement for interrogating the relevance of contemporary art practice in such a situation. Moreover, such an obsolete way of mobilizing materials creates a clash of temporalities, the slowness of the movement of an insignificant brick wall versus the fluid construction of multi-story high-rises in the background. Lin has opened up a critical space for rethinking the randomness and brutality of economic development within a rigid system of movement. 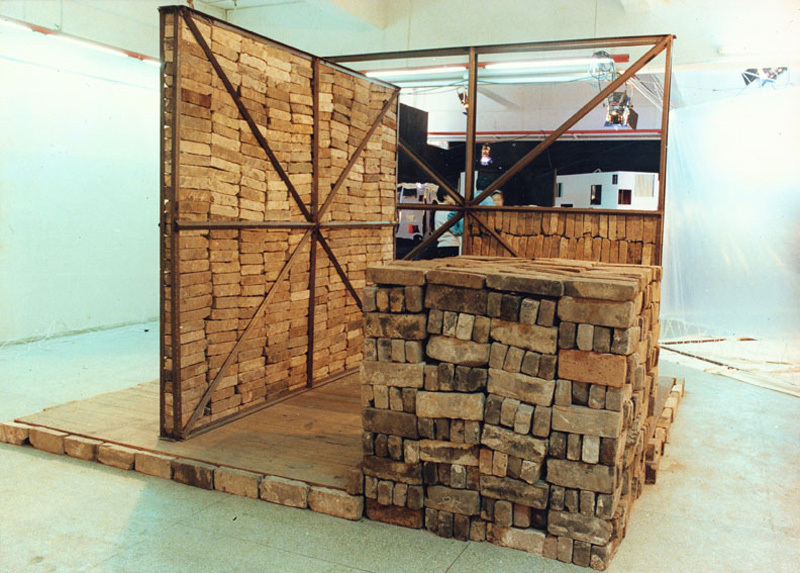 The wall functions as a symbol of national and cultural borders; by moving it across the street, and creating urban chaos in the process, Lin showed the precarious position of nations when their political and economic borders shift. It also functions as a resistance to the forces of modernization of which the city of Hong Kong embodies. 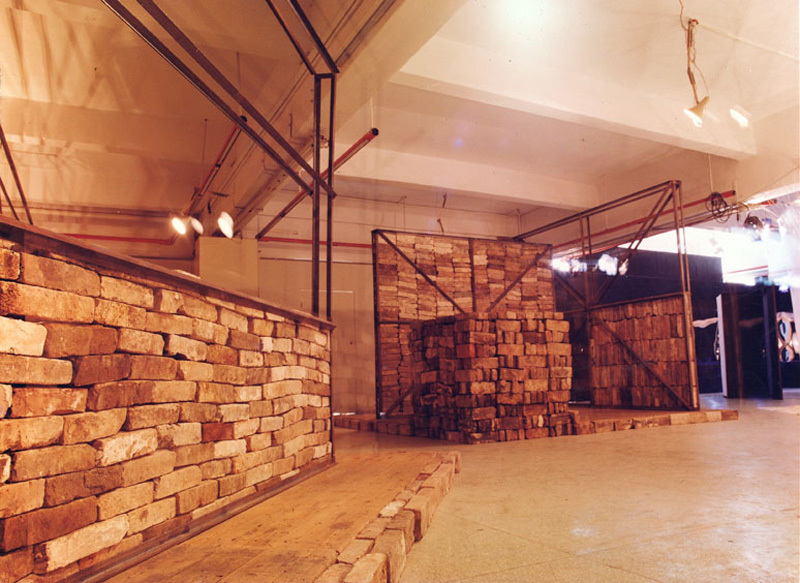 Wall (1991) appeared in the first exhibition of Big Tail Elephant. The herd rented a hall in Guangzhou’s Workers’ Palace and trumpeted their wares. 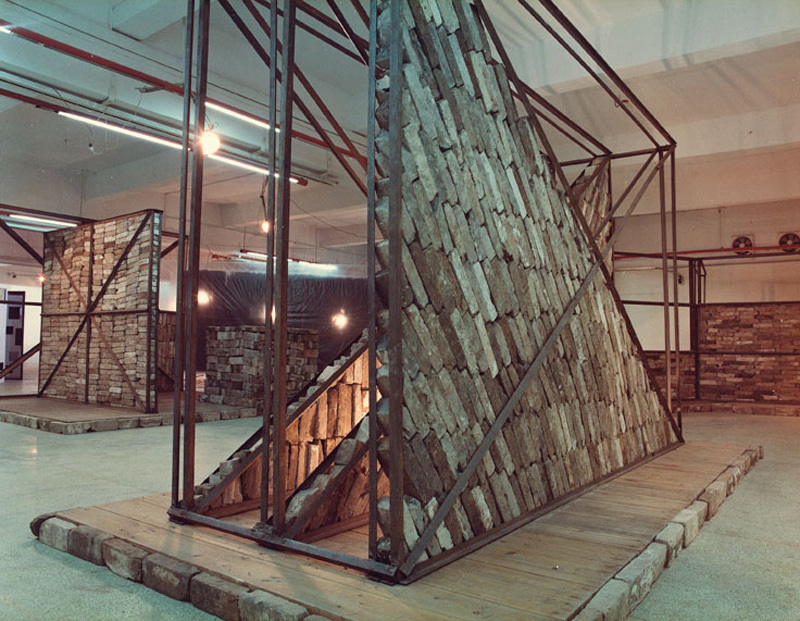 At the time, Lin scarcely understood the meaning of « installation. » The 1980’s had opened China to a flood of western art, but Lin’s quick scan of twentieth century art left him confused. He resolved to begin with a concept, and develop it. The power of a wall comes from the physical effort to build it. 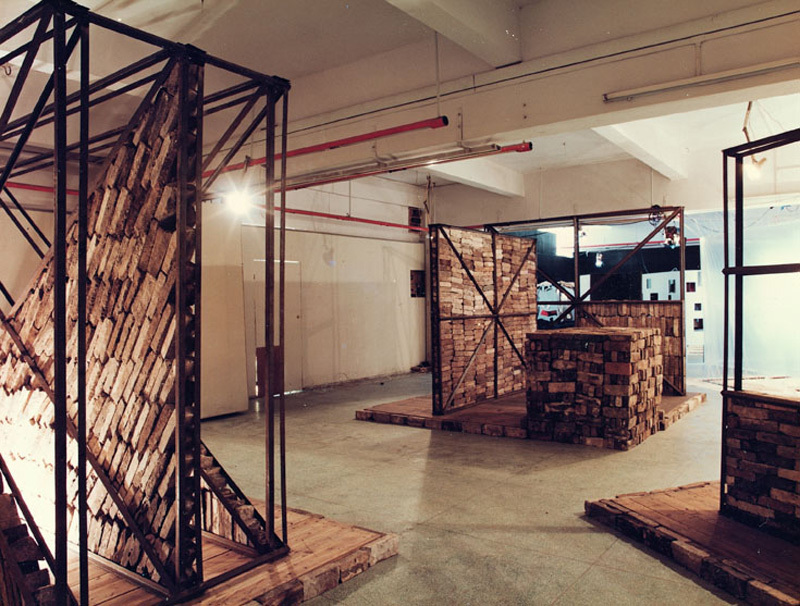 Lin put together the architectural structure Wall without any help from construction workers. He hauled all the bricks himself, taking them from the rubble of demolished buildings. Lin put a great deal of effort in his Wall, and it is powerful. « Wall » as a concept holds special significance in China – the Great Wall, the wall around the Forbidden City where the dynasts lived. But walls are everywhere, walls of silence, walled up emotions, the Berlin wall, governmental walls. 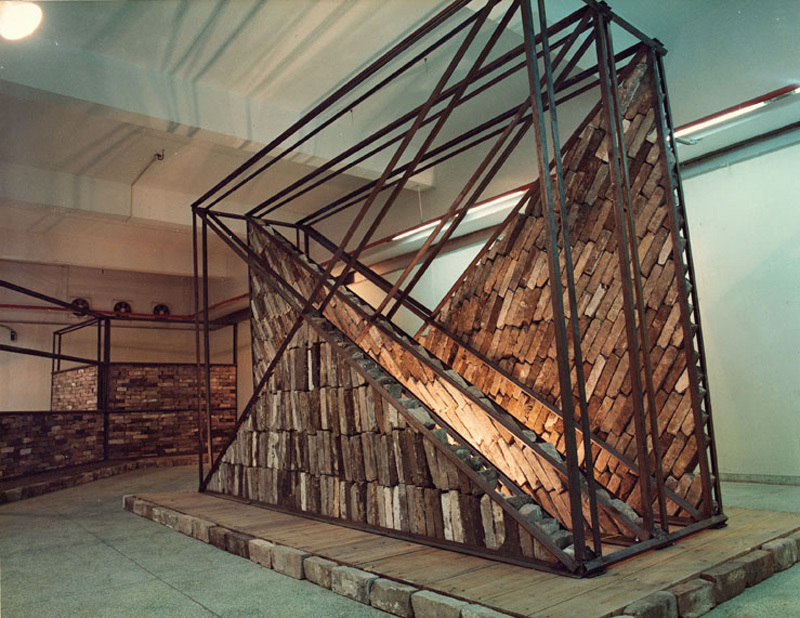 In 1991, within the framework of a Canton group exhibition he constructed enormous sculptures, symbols of walls, from bricks and angle-irons, collected or bought at a demolition site. He called this piece Standard Series of Ideal Residence Buildings: In this series of works I used architectural techniques to summarize my own knowledge of architecture… These works were built in contradiction to architecture and tending more towards Fine Arts but because they are installations with a limited life-span, they are contradictory to sculpture. Another aspect of his conception is the essential clarification of physical energy and power found in the working process of his installations. For the execution of architecture or sculpture one needs only physical strength. The thinking develops according to physical strength.